This entry was posted in 2015 Press: reviews / interviews / features, literary fiction, politics and tagged #9/11novel, #thepermanentpress, 911 truth, 99%, Big Agriculture, childhood obesity, political satire novel, town of amenia on November 30, 2015 by VN Alexander. On Saturday, July 18th I’ll be at the NorthEast-Millerton Library at 1PM. Pick up a copy of Locus Amoenus at Oblong Books to bring with you to have signed. Here’s a piece from the June issue of Main Street Magazine. This entry was posted in 2015 Press: reviews / interviews / features, literary fiction and tagged 911 novel, 99%, amenia ny, childhood obesity, millertonNY, organic farming, shepherdess, sustainability, town of amenia on July 8, 2015 by VN Alexander. It takes a hamlet. Amenia, NY. 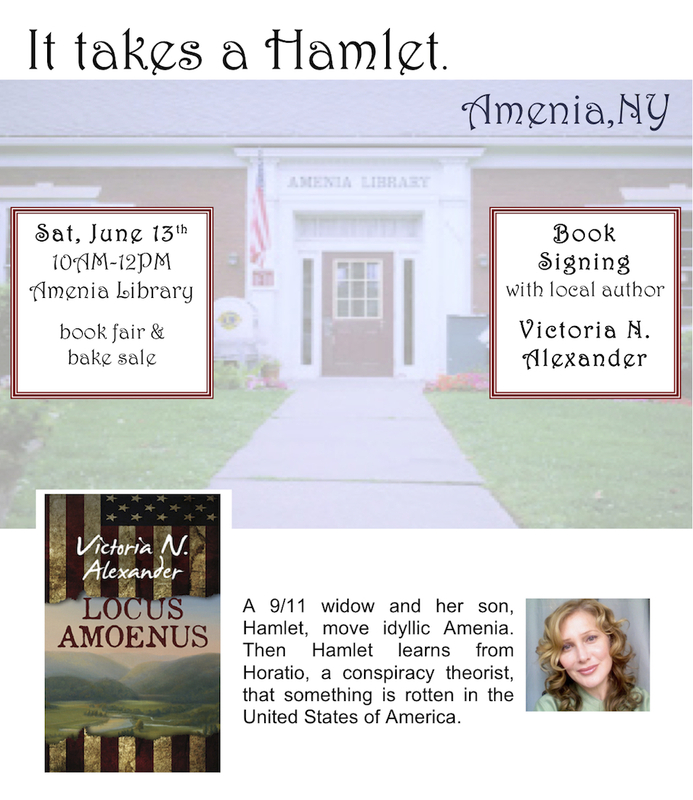 The wonderful tiny library in the hamlet of Amenia will be hosting a book signing for Locus Amoenus, the story about Hamlet, set in Amenia. There will also be a book fair (with used books) and bake sale to raise money for the library. The Presbyterian Church behind the library will be hosting its annual strawberry fair in conjunction with the book fair. This time I won’t be sharing my book table with a celebrity author like last week in Millbrook. I will be sharing my table with muffins and scones baked by some of Amenia’s baking masters. 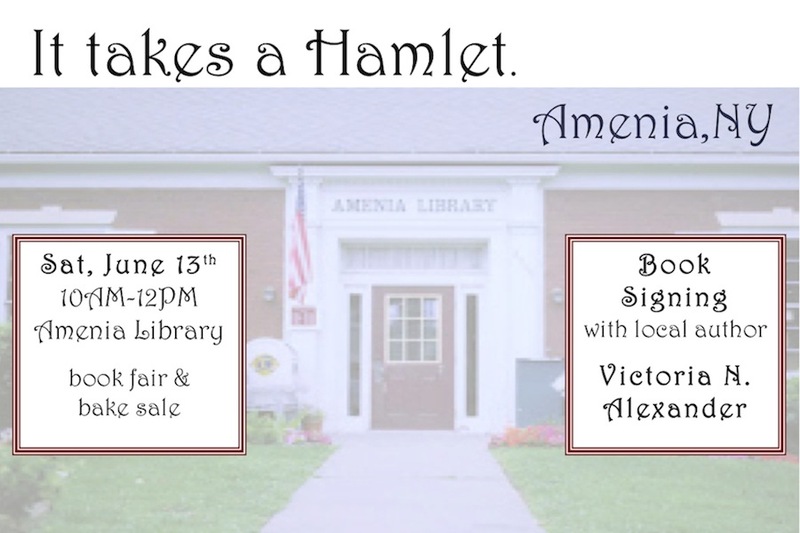 Please come out and support the library, which has been the heart of our life in Amenia for these last twelve years. Lucian got his library card when he was a week old. And the librarian, Mrs. Devine, was the first friend I made in the hamlet. All proceeds from book sales to benefit the library. Unfortunately, I will only have a handful of preview copies available for sale. Last week the publisher let me know that the hardcover release has been delayed again for another week. Books ship on the 14th or so. But the Kindle and Nook versions have been released ahead of the hardcover. Friends who have already read the preview copy of Locus Amoenus can now post reviews on Amazon. Please do so! For more info about the book go to http://amzn.to/1JwwkmO Get the Kindle version today or pre-order the hardcover at a big discount. This entry was posted in literary fiction and tagged #9/11novel, #ameniany, #sustainabilityfiction, 911 fiction, 911 novel, Big Agriculture, Big Pharma, childhood obesity, conspiracy theorists, Intelligence Industry, literary fiction, locus amoenus, sustainability, town of amenia on June 7, 2015 by VN Alexander. This entry was posted in 2015 Press: reviews / interviews / features, literary fiction and tagged 911 fiction, 911 novel, 99%, amenia ny, Big Agriculture, Big Pharma, conspiracy theorists, controlled demolition, political satire novel, sustainability, town of amenia on April 16, 2015 by VN Alexander. On May 30th, I’ll be participating in the best little literary festival in the Harlem Valley. The Festival will feature over fifty thought-provoking, and thoroughly entertaining authors and illustrators from the region participating in panel discussions, readings, and signings throughout the day, from 9:45 – 4:30 at the Millbrook Free Library on Franklin Street in Millbrook New York. I will be signing copies of and answering questions about my latest novel, Locus Amoenus (Permanent Press, 192 pages). The story of is set in Amenia, which is right next door to Millbrook. I anticipate lots of locals at my table trying to find out if they appear in the story. No spoilers! Here’s a brief synopsis In this dark comedy, a 9/11 widow and her son, Hamlet, have retreated from Brooklyn to the idyllic rural countryside upstate, where for nearly eight years they have run a sustainable farm. Unfortunately their outrageously obese neighbors, who prefer the starchy products of industrial agriculture, shun their elitist ways (recycling, eating healthy, reading). Hamlet, who is now 18, is beginning to suspect that something is rotten in the United States of America, when health, happiness and freedom are traded for cheap Walmart goods, Zoloft, endless war, standard curriculum, and environmental degradation. He becomes very depressed when, on the very day of the 8th anniversary of his father’s death, his mother marries a horrid, boring bureaucrat named Claudius. Things get even more depressing for Hamlet when his friend Horatio, a conspiracy theorist, claims Claudius is a fraud. The deceptions, spying, corruption, will ultimately lead, as in Shakespeare’s play, to tragedy. For details see the festival website millbrookbookfestival.org. This entry was posted in literary fiction and tagged 911 fiction, 99%, Big Agriculture, Big Pharma, childhood obesity, Intelligence Industry, political satire novel, sustainability, town of amenia on April 5, 2015 by VN Alexander. The galleys (review copies) of Locus Amœnus came out today. Permanent, the publisher, will be sending them to Library Journal, Kirkus, and Publishers Weekly and various other trade review publications. Locus Amœnus will be out very, very soon. You can pre-order from Permanent or from Amazon at a 15% discount. 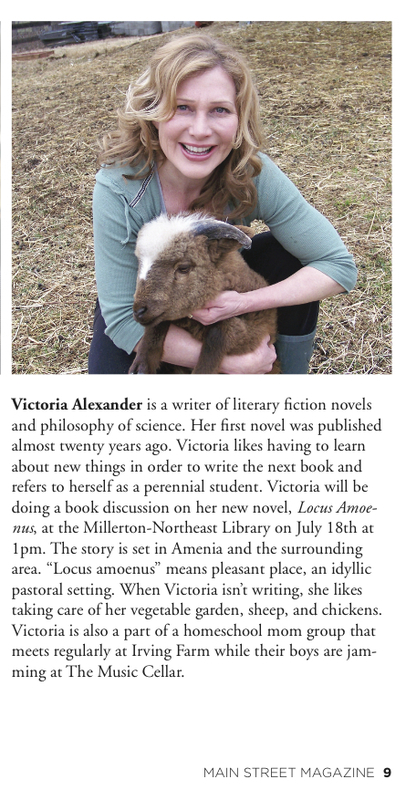 This entry was posted in literary fiction, politics and tagged 9/11, literary fiction, locus amoenus, small press, town of amenia, victoria n. alexander on February 11, 2015 by VN Alexander. 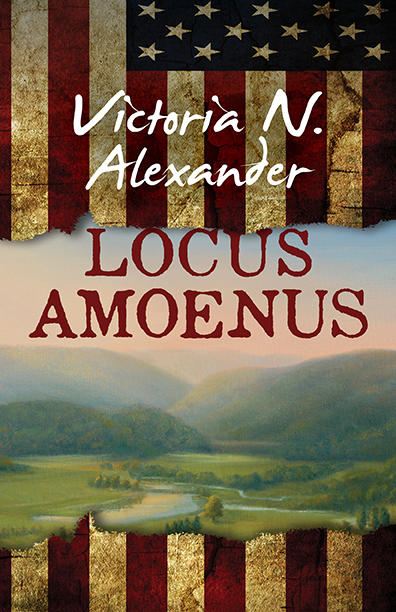 Okay, so maybe picking a Latin phrase, Locus Amœnus, with its weird spelling, for the title of my latest novel might make it a little hard for people to recommend it to friends. (If you order now from Amazon you can get 13% off.) Locus amœnus can be pronounced in English, Low cuss a men us, with stresses on “low” and “a.” In Latin you want to make “amœnus” sound more like “a moin us.” I have also heard amœnus pronounced “uh mean us.” Any of these are acceptable. This is America, after all. This entry was posted in literary fiction, politics and tagged 911 fiction, 911 novel, 99%, amenia, amenia new york, amenia ny, Big Agriculture, Big Pharma, childhood obesity, conspiracy theorists, controlled demolition, DIY politics, eco living, how to pronounce locus amoenus, Intelligence Industry, literary fiction, living like a Quaker, locus amoenus, nanothermite, organic farming, political satire novel, small press, sustainability, town of amenia, weapons industry on February 4, 2015 by VN Alexander.